in a fun online psychology clss game. 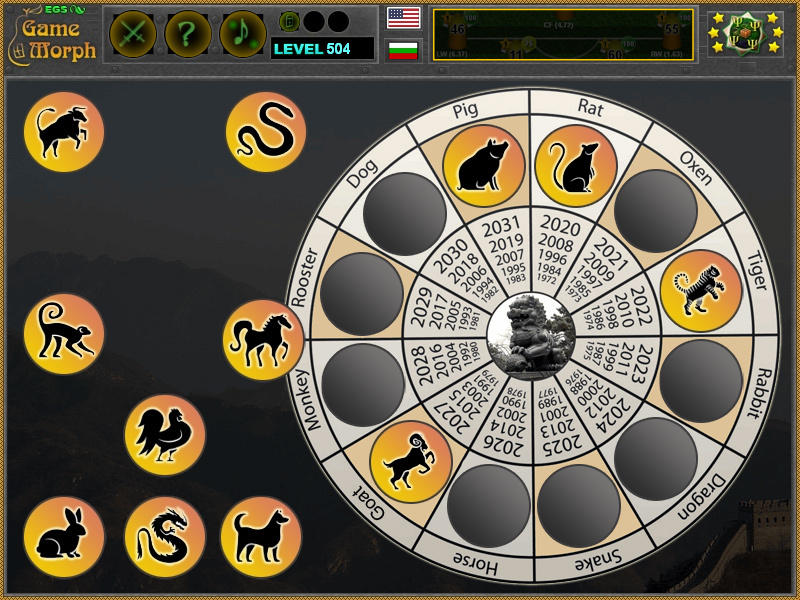 "Chinese Zodiac Puzzle" is a free online knowledge level game about the zodiac from China calendar. laptops and tablets, which may be played in the web browser. 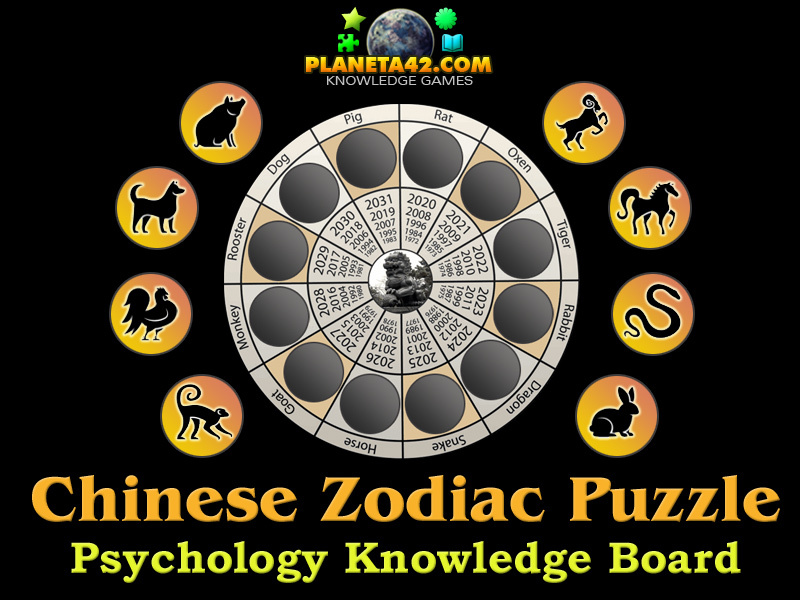 The Psychology Knowledge Board include 12 animal zodiac pictures to play with. Which are the zodiac symbols of Chinese calendar? What year define the animal from the Chinese zodiac? Which years are the Horses born? How many zodiac animals have the China zodiac? Which are the animals from the Chinese zodiac? How to play Chinese Zodiac Puzzle. There are 12 zodiac pictures on the left of the screen, representing the animals from the Chinese zodiac. Place them in the corresponding zodiac sign in the wheel. The icons will remain active until placed correctly. Know the symbols, the names and the years for the Chinese Zodiac. The astrology itself is connected with astronomy, but giving traits to humans is pretty much a psychology. Here we look at the Chinese zodiac. Like western zodiacs it has 12 animals, but the zodiac do not take the month in account, but the year. So every animal is for a number of fixed years and every year is different. The following is the near years for every zodiac. 1. Rat - 1924, 1936, 1948, 1960, 1972, 1984, 1996, 2008, 2020, 2032. 2. Ox - 1925, 1937, 1949, 1961, 1973, 1985, 1997, 2009, 2021, 2033. 3. Tiger - 1926,1938, 1950, 1962, 1974, 1986, 1998, 2010, 2022, 2034. 4. Rabbit - 1927, 1939, 1951, 1963, 1975, 1987, 1999, 2011, 2023, 2035. 5. Dragon - 1928, 1940, 1952, 1964, 1976, 1988, 2000, 2012, 2024, 2036. 6. Snake - 1929, 1941, 1953, 1965, 1977, 1989, 2001, 2013, 2025, 2037. 7. Horse - 1918, 1930, 1942, 1954, 1966, 1978, 1990, 2002, 2014, 2025, 2038. 8. Goat - 1919, 1931, 1943, 1955, 1967, 1979, 1991, 2003, 2015, 2026, 2039. 9. Monkey - 1920, 1932, 1944, 1956, 1968, 1980, 1992, 2004, 2016, 2027, 2040. 10. Rooster - 1921, 1933, 1945, 1957, 1969, 1981, 1993, 2005, 2017, 2028, 2041. 11. Dog - 1922, 1934, 1946, 1959, 1970, 1982, 1994, 2006, 2018, 2029, 2042. 12. Pig - 1923, 1935, 1947, 1960, 1971, 1983, 1995, 2007, 2019, 2030, 2043. Labels: Mind Games , Puzzle Games , Flash Games , Psychology Games , Education Games , Free Online Games.